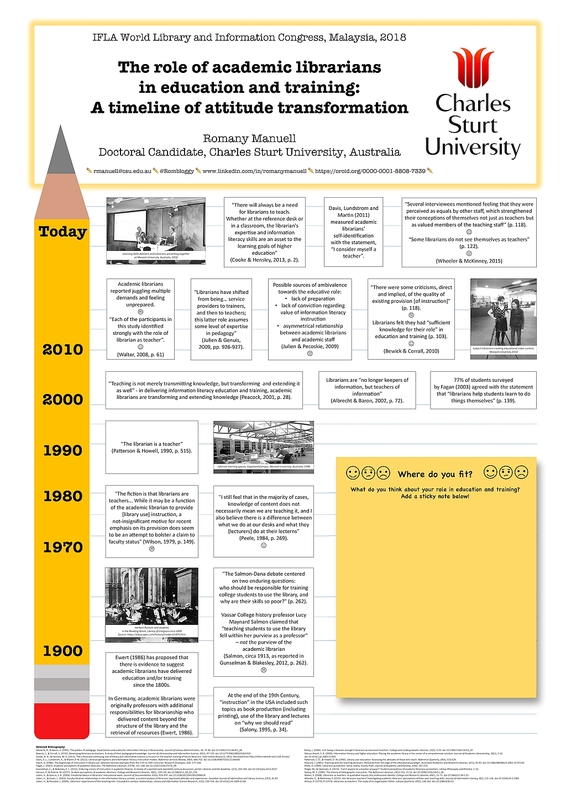 MANUELL, Romany (2018) The role of academic librarians in education and training: A timeline of attitude transformation. Paper presented at: IFLA WLIC 2018 – Kuala Lumpur, Malaysia – Transform Libraries, Transform Societies in Session 153 - Poster Session. Academic librarians in university libraries perform a variety of roles. For many librarians, this includes a role in the education and training of university students, faculty staff and/or colleagues in areas related to information literacy. Despite the wealth of literature documenting the existence of librarians’ educative role throughout the history of university libraries, anecdotal and empirical evidence suggests not all librarians are comfortable with this aspect of their position. 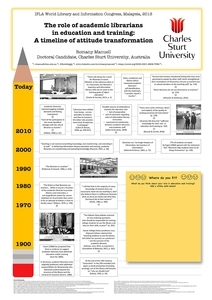 An investigation of attitudes towards the educative role forms part of my doctoral research at Charles Sturt University in Australia. A completed literature review has revealed the worldwide transformation of librarians’ attitudes towards education and training in university libraries. This transformation is represented graphically on the submitted poster through the use of a timeline. The chronology of attitudes towards education and training is illustrated through images of librarians at their work and accompanying quotes from both professional and academic literature. A greater understanding of the history of academic librarians’ attitudes towards the educative role can provide librarians with opportunities for reflection on their role and practice, which may contribute to better learning outcomes for university library users. During the IFLA World Library and Information Congress in Malaysia (2018), delegates were encouraged to add their own attitudes towards education and training to the poster via sticky notes. Some of the 15 responses gathered at the congress expressed surprise at having to perform an education and training role in libraries. Most of the recorded attitudes towards the role were positive in nature, reflecting much of the literature shown on the poster. Feelings of ambivalence and/or discomfort in regard to education and training were not recorded as often on the sticky notes by congress delegates.